When the four Nashville-based Wooten Brothers arrive in Buffalo today to play the Tralf Music Hall (622 Main St, downtown, showtime 8pm, $34), they’ll bring more than just Grammys and a status as world-renowned aces of their respective instruments. Rooted in their unique family brand of funk and soul, brothers Victor, Roy aka Futureman, Regi and honorary Buffalonian Joseph bring a warm, nurturing vibe that transcends sound and shoots straight to the soul. To put it frankly and personally for the sake of making the point, I rarely listen to recordings of bass virtuoso Victor Wooten, but he has been for 16 years one of my favorite musicians to see live, so captivating are both his jaw-dropping playing and peaceful, easy demeanor. These, of course, are common traits among the Wooten Brothers. 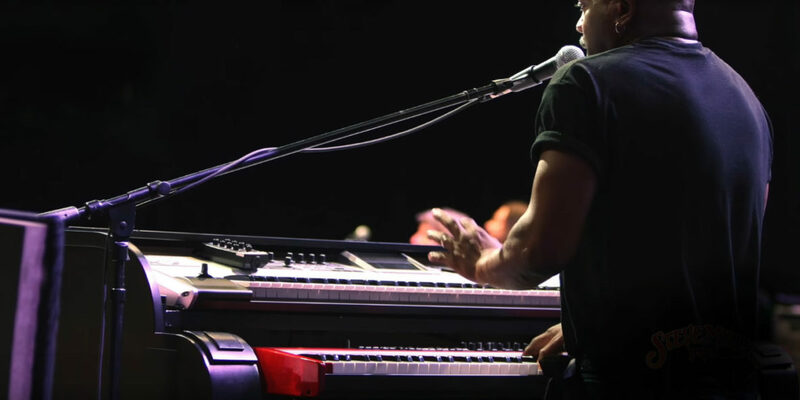 Joseph, in particular, has displayed them in Buffalo at great length over the past four years while not on the road as keyboardist with the Steve Miller Band, after a one-off headlining gig at a now-defunct downtown venue led to regular visits to speak at schools and soak in the scene – his current visit will include time spent planning more in the winter, spring and summer of 2014, for which we pledge to cover. While on the road during this 13-city, 14-day tour that stops in Buffalo tonight, Joseph spoke about his upbringing, music, “I Matter” campaign and ties to Buffalo, as well as the ties that bind them all. Can you describe how being in a musical family influenced you beyond guiding your career path? I think we would’ve been guided toward the greater good anyway, because of my parents. My dad made sure we had the things we needed, and mom made sure we were people of substance. We just happened to decide to play music, so we applied her principles to music because integrity and character are things that aren’t just musical, but universal. My father used to say, “When you wake up in the morning, look in the mirror – you’re gonna see the greatest person you’ll see all day, but you’re not better than anyone else.” He made sure we were not arrogant. We could see that five brothers playing music at a high level was special – but we knew that we weren’t better than anyone else, just different. Our parents were careful enough make sure we had the substance and inner-character to survive what eventually was gonna wind up being a tough career choice. How do you convey these life lessons to those who don’t see music as a central part of their lives? WelI, I tell them that what I learned about music applies to the rest of life. I also tell them that just like an athlete who doesn’t practice well doesn’t play well, school is practice for rest of your life – all the basic tenets they’re trying to reach you with in school are the same that allow you to keep opportunities in life if you get them. My mother would say, “What does the world need with just another good musician? We have keyboards, bass, singers – what the world needs more of is good people.” Be more concerned with who you are as opposed to how well you do something…in everything, work on who you are, not just what you do. What first inspired you to spend so much time in schools? I had a concert to play in Buffalo one time – a lady named Katie Hildreth put her own money up and brought me to town to play the Lafayette Tap Room. I was using Rodney Appleby on bass for the gig, and met his ex-wife Linda in passing on Facebook. She came to the concert, and as at time she was still teaching, welcomed me to come speak with her students. It went so well that she went to the School Board to see if they would fund me coming back up to speak with other schools. I always say that what I’m doing with young people in Buffalo is just extending what Linda has been doing for well over 35 years. I get a chance to come in as the keyboard player for the Steve Miller Band and Wooten Brothers and speak on behalf of young people – often times when she does it, nobody sees it. I’ve seen her visit young people in jail, visit funerals, all too many. Has this experience changed the course of your career? It has given me more of a chance to do what I try to do anyway. I want to live a high-quality life, and I would like for the live I life, if anyone’s watching, to be a good example. The power of a good example goes much farther. The kids’ BS meter should get a lot more credit – young people can sense when somebody has something to say to them of substance and when that’s not the case. It seems to me, when I go to speak, the schools they tell me is gonna be the worst are ones where I’m best received. I feel that often times, the schools that have the “most problems” are those that most need somebody speaking something substantive. Those kids are the most gracious; apt to stay in touch; send thank-you notes; recognize you the next time they see you. There’s nothing more rewarding than inspiring a young person, seeing that somebody has done better or at least been encouraged by something you did. That’s worthwhile; the highest calling of an adult is to be a good example to a kid. I was just talking to Linda about once again, another student of hers had been shot and killed – she said that over the course of her 37 years of teaching, in these last few have been over 55 funerals just of former students. Every time you see a kid who does the wrong thing, that means there’s an adult who’s let them down. What inspired you to start “I Matter”? Everybody’s important – it’s the same theme. “I Matter” was written for that purpose – a song for the ones who aren’t champions; who’ve been trampled on; who don’t have a home; who have a chemical addiction. Champions are always gonna get a song, always gonna get accolades. Sometimes this fosters a society that thinks only winners are the important ones; that doesn’t value the ordinary, deems it worthless. But the ordinary is extraordinary – ordinary sunsets are extraordinary, and ordinary kids are, too, if you take the time to look at them in proper context. The website is there so that other people could let others know about these extraordinary people in their lives. I particularly enjoyed the videos with homeless people and how personal you make them. The thing about speaking to homeless people, that wasn’t something I tried to do for a purpose – I’d just read that the worst part of being homeless is feeling like you’re invisible, feeling that you don’t matter. So when I see a homeless person, I try to have conversation with them. To see people of such substance, their experience has a lot more depth than those who aren’t homeless; rather than me go tell their story, I ask them to tell their story, record it, and put them up for others to see. I’ve met people who spoke five languages; authors; funny people; wise people; very good singers; I think it’s important for everybody to feel that connection, and I’m trying to not so much lead by example, just to have my example be a good one. There’s a large body of people who want to do better, but don’t know how; it takes some people strong enough to swim against the current to help others until you can change the current. What’s in store for the concert Monday and your next trips to Buffalo? For Monday with my brothers – we don’t even get a chance to be in the same room very often, so this tour of 13 cities in 14 days with Buffalo one of the stops is special for us. We’re dedicating it to my brother Rudy’s memory – he passed away four years ago in July, played two saxes at same time, it was all he ever wanted to do. For the future, we’re planning more school visits and concerts, seeking more collaborations as soon as January and into June. I enjoy coming to Buffalo. I enjoy how Buffalonians love their city; how they protect the rep of their city, don’t like people talkin’ bad about it. I enjoy how they leave Buffalo but come back. Buffalo has a legacy of being a final stop on the Underground Railroad – it’s the coolest thing to know that slaves were aspiring to come to Buffalo. And the fact that at one time it had the most millionaires per capita; there’s a large legacy that it will live up to again, I hope. I see that there’s a project called the “Buffalo Billion,” reinvesting – I hope that when they do, they don’t just invest in people who have money already. I hope they reach down to problems of poverty and worse, hopelessness, which breeds somebody who lives as if there’s nothing for their future. I hope they find a way to eradicate that, and I’m willing to do whatever I can – Buffalo’s been kind to me. “I believe Joseph’s message resonates so profoundly with students, and adults as well, actually, because his songs, lyrics and content speak to one’s heart as well as their soul. Many of his songs address issues that some may be reluctant to express, or incapable of expressing. “With urban children in particular, his song ‘I Matter’ is especially poignant because it identifies some of the issues that so many of our students face on a daily basis, either with their own lives, or in the lives of their loved ones. From being singled out because they are not good enough, to being wrongly convicted, to being different, or even physically constricted. “Many of our public school students come from abject poverty, and are surrounded by so many of the issues that Joseph writes about. His songs also speak about hope, unity, working together, racism, love and freedom. “Those ideas coupled with Joseph’s extraordinary command over his instrument, his ease with speaking with either one person, or an auditorium filled with hundreds, doesn’t faze him. The students and adults alike recognize his truth, sincerity, genuineness, and wisdom, and look forward time and time again for his return.